In the spring, my husband and I made the decision to move our two youngest daughters, ages 10 and 8, to a new school this fall. It was not an easy decision and one that only came after lots of discussion. With the start of school less than two weeks away, the reality of the choice is setting in for everyone. My youngest will be going into third grade and she is quite excited. My middle daughter, however, will be going into fifth grade and she is having very mixed emotions about it. I am still confident that we are doing the right thing, but change is never easy. Here are a few tips I have found that are helping to ease the transition and will, hopefully, continue to clam their nerves (and mine!) as we get closer to the first days of school. Visit and/or tour the school - We took our girls to visit the school last spring as we were in the decision making process. They actually spent a day visit in the classrooms! There are also a couple upcoming orientations and, of course, open house. We have made a very specific effort to put all of these on our calendar and make sure our schedule is clear to attend. Make sure they have all the necessary supplies and forms filled out - We have already done shopping to make sure we are in compliance with the dress code that is new to us. We also made sure to purchase all the needed supplies. We added a little fun with picking out new backpacks and lunch boxes. Making sure they have everything they need gives them one less thing to worry about on the first day. 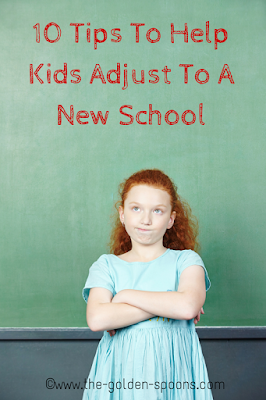 Remind them of other times they have experienced change - Have your kids changed schools before? Moved to a new home? Remind them that, even though it may have been hard, they did it successfully and they can be successful with this change, too. Keep consistency where you can - Despite driving to a new school, our morning routine will be much the same as it has been in the past. We also allowed our girls to continue with the extracurricular activities they have done in the past rather than forcing them to change to different leagues/instructors closer to the new school. Although changing those activities might be more convenient, keeping them the same provides some consistency amidst the change. Help them make new friends (and keep old ones) - Admittedly, I am not a big play date mom. However, as my kids begin to make new friends at their new school, I know I may need to go out of my comfort zone to help foster those friendships through outings, playdates, and parties. I'm also allowing them to keep old friendships through phone calls and technology as much as I can. Talk to their teachers - Whether you have to reach out on your own or just take opportunities as they are presented (such as open house), make sure your kids' new teacher are aware that this is a new school for your family. Make them aware of any learning difficulties your children have and/or any personality "quirks" they might display. Letting teachers know this information up front helps them be more readily able to relate to your child(ren). Give your kids something to look froward to - Everyone likes to be rewarded! Celebrate a successful first day or first week by taking the kids out for ice cream or for a special experience. Let them know that you appreciate the effort they have put into adapting to their new situation and reward them for their success. Be honest about your own feelings - The truth is, I am changing schools, too. I will also have to make new friends, find new ways to volunteer, and adjust to new schedules. While this should be easier for me as an adult, it is not without a few nerves and a bit of stress. I am trying to let my kids know that they aren't the only ones who are apprehensive so they know they are not alone. Listen to their concerns and fears - Encourage you kids to express their feelings and listen when they do. Sometimes, being able to talk to someone can be the best remedy for a stressful situation. Make sure your kids know they can talk to you about what they are feeling and try to help them deal with those feelings accordingly. Focus on the positives - Since my 10 year old is the most uneasy about this change, we have tried to keep reminding her of things we know are important to her. For example, she is my "tech" kid and the new school issues every student an iPad! This is a big "selling point" that we frequently use to re-energize her excitement and parlay her hesitation. Has you family experienced a change such moving or changing schools? What tips do you have to add for helping kids adjust? This post was part of the One Word Blog Linkup hosted by, Janine of Confessions of a Mommyaholic and me! This week, the word prompt choices were Blessing and Absurd. If you would like to join the linkup you can find more information HERE, sign up for weekly emails HERE, and/or join our Facebook group HERE. Every Friday, two prompts are emailed. Choose one and write a post using that word as inspiration. Linkup up any time between 6:00am EST on Wednesday-9:00pm EST on Thursdays on any of the host sites. As a teacher, I think those are great suggestions and would be helpful for any new student. I always tell my new students to find ways to get involved at school too! Go to dances, join clubs, etc. if a student feels like they have a place at the school, they feel more connected! :) Good luck to your kiddos!! I'm sure they will have a great school year! That's a great suggestion, too! I changed schools because we moved in 4th grade and it was hard having to get to know new people and being the new kid. These are excellent tips! Thanks! I think they will be fine, but it will be an adjustment for all of us. Those are definitely great suggestions. Most of them, I think I tried to follow, when mine were still in public school. I am glad that we don't have so many hoops to jump through as a homeschooling family. Have a great week, Lisa! We've only begun a new school when Tucker went to kindergarten and it was so so so hard. You give great advice here! We went and met the teacher when nobody else was there. It helped him (not sure your girls need that but it helped him anyway). I hope the new school is a really perfect fit for them! It's a big subject for me because I had to change schools before kindergarten and that made me soooo nervous for Scarlet starting kindergarten. I wish these tips had been better applied to me. My youngest went to spend a little time with her teacher today! I think it did help them both get to know each other. I hope it's a good fit, too! Well, nothing is perfect and I'm sure we;ll have bumps, but hopefully doing these things will help all of us!. Arguing About Arguing - And Other Ridiculousness!